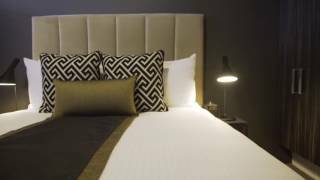 Alex Perry Hotel and Apartments is where couture design meets playful intelligent style culminating in self -catering accommodation perfectly suited for the modern corporate and leisure traveller. With a choice of accommodation options; from Studio style rooms through to One and Two Bedroom Units and Executive Styled Apartments there is a choice of accommodation suited to your needs. 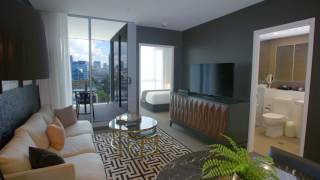 Executive style apartments include a small balcony with seating for two, an extended amenities range, inroom magazines, GHD Styling tools, personal garment steamer, over 90 channel foxtel package and 5G of free wi-fi daily. Unique design elements flow from expertly crafted furnishings, through their exclusive range of Sleep Elite beds and on into designer amenities thus ensuring a stay at the Alex Perry Hotel and Apartments is a complete sensory experience. Alex Perry Hotel and Apartments is a strictly Non-Smoking Property. Hotel recreation facilities are strictly for the use of registered guests. Two Bedroom Apartments boast a self catering kitchen, 121 centimetre high definition LED smart television with Entertainment Foxtel package in the living area, study desk/workstation, in room laundry, each bedroom features their exclusive 'Sleep Elite' Queen Beds with body conforming gel infused memory foam and pressure relieving Latex comfort. 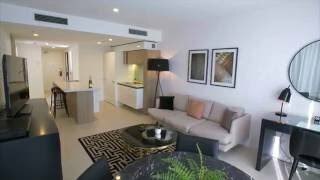 With an en suite off the master bedroom, this style of apartment is perfect for those travelling with friends. The rooftop recreation area including the sundeck, pool and gymnasium ensures you have access to views of the city skyline. Two Bedroom Apartments have a maximum occupancy of four guests and are approximately 72 square metres. 5G complimentary wifi included daily. Additional wifi is available for purchase. Two Bedroom Executive Apartments offer a self catering kitchen, 121 centimetre high definition LED smart television with Platinum 90 plus channel Foxtel package, study desk/workstation, in room laundry, separate bedrooms each featuring exclusive 'Sleep Elite' Queen Beds with body conforming gel infused memory foam and pressure relieving Latex comfort and two bathrooms. 5G complimentary wifi daily, with additional data available for purchase. Travel to the twelfth floor rooftop recreation area to relax or make use of the the sundeck, barbecue pavilion, heated lap pool or cardio room and enjoy the city skyline views. Two Bedroom Executives cater for a maximum of four guests and are approximately 81 square metres including a small balcony with seating for two. Perfectly tailored to the overnight hotel guest, each Studio offers the convenience of a hotel room with the in room services of an apartment including: self catering kitchen, 121 centimetre high definition LED smart television with Entertainment Foxtel package, workstation, in room laundry and internal bedroom space featuring their exclusively made 'Sleep Elite' Queen Bed with body conforming gel, infused memory foam and pressure relieving Latex comfort. The rooftop recreation area including the sundeck, pool and gymnasium ensures you have access to views of the city skyline. Studios have a maximum occupancy of two guests and are approximately 47 square metres. 5G complimentary wifi daily, with additional data available for purchase. Perfect for multi night city stay, the One Bedroom Apartment boasts a self catering kitchen, 121 centimetre high definition LED smart television with Entertainment 40 plus Channel Foxtel package in the living area, study desk/workstation, in room laundry and separate bedroom featuring their exclusive 'Sleep Elite' Queen Bed with body conforming gel infused memory foam and pressure relieving Latex comfort. The rooftop recreation area including the sundeck, pool and gymnasium ensures you have access to views of the city skyline. One Bedroom Apartments have a maximum occupancy of two guests and are approximately 50 square metres. 5G complimentary wifi daily, with additional data available for purchase. One Bedroom Executive Apartments offer a self catering kitchen, 121 centimetre high definition LED smart television with a 90 plus Channel Platinum Foxtel package, study desk/workstation, in room laundry, separate bedroom featuring their exclusive 'Sleep Elite' Queen Bed with body conforming gel infused memory foam and pressure relieving Latex comfort. Travel up to the twelfth floor rooftop recreation area to relax or make use of the the sundeck, pool and gymnasium and enjoy the city skyline views. One Bedroom Executive Apartments have a maximum occupancy of two guests and are approximately 57 square metres. 5G complimentary wifi daily, with additional data available for purchase when booked direct with the hotel 20 dollars of standard calls within Australia are included daily making the One Bedroom Executive Apartment the preferred accommodation choice for the Brisbane corporate traveller.